There are a lot of fitness trends that may sound good, but are just not a great fit for all levels. Basketball may look like fun, but for those who aren’t naturally coordinated it may prove to be a bit of a struggle. Running can be a great way to zone out and get fit but quickly wear on joints and ligaments. 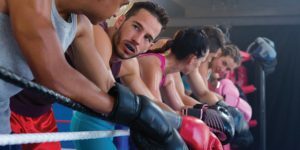 Fitness boxing is perfect for a number of reasons. If you are new to putting on the gloves, there is no real pressure to have to keep up. The heavy bag is not going anywhere. You will not get “left behind.” There is certainly a technique to punching, but really all you are expected to do on day one is put leather to leather. There is more to fitness boxing than just arm strength; much, much more. Boxing uses the whole body, literally from head to toe. Let’s say your shoulder is feeling a bit sore. That’s a great opportunity to work on footwork! Knee a little tight? Sounds like it is time to work on your straight punches to the head, with a little less bend. With options for core strengthening, legs, arms and even head movement, there is always something that can be done. Regardless of age, gender or fitness level, you start where you start. Your level of intensity is dependent completely on your personal progression. If you would like to prioritize technique without power punching, that is up to you. 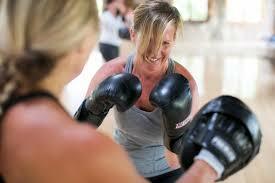 Working out on your own, you have the ability to set your timer for one minute rounds or five minute rounds. You can build at your own pace, easily keeping yourself accountable with the help of a timer or boxing app (yes, that is a thing). There are old grandmas who take fitness boxing classes, and there are children who are running circles around some of the adults. From professionals to those who have never even seen a heavy bag, the learning curve for basics is not steep. Even those in wheelchairs have been known to get work in with a partner or a coach holding mitts. The moral of the story is, drop the excuses, grab your gloves and let’s do this.